New Delhi, June 4th, 2015: On the eve of World Environment Day, car market leader Maruti Suzuki India Limited (MSIL) said it would continue its work on bringing down vehicle emissions as a means to promote clean air and delight customers. Maruti Suzuki’ parent company Suzuki Motor Corporation had showcased three new technologies at the Geneva Motor Show which include a new-generation light weight platform, a new downsized direct-injection turbo petrol engine called BOOSTERJET and the SHVS mild hybrid system. These future technologies will bring down emissions while raising vehicle performance. These technologies could find relevance in India and the Company may explore these options as per customer requirements. With focussed efforts, Maruti Suzuki has been successful in bringing down the weighted average of CO2 emission by over 11.6 % in last five years. This has been possible through fuel efficiency improvements, reduction of exhaust emissions and development of alternate fuel products during this period. As a focused initiative, Maruti Suzuki engineers worked towards improving fuel efficiency and bringing down emissions per car in 2014-15. The three most fuel efficient cars in India are all from Maruti Suzuki: Celerio, DZire and Ciaz. a) Introducing changes in engine hardware to improve thermal efficiency and engine calibration. b) Optimizing transmission gear ratios for better drive and fuel efficiency. f) Adopting advanced thermal management system along with low friction engine oil and modified fuel injection system that assist faster warm up to improve engine efficiency of diesel engine. g) Introducing new generation alternator management to optimize the charging of battery through alternator and hence contribute to better fuel efficiency. 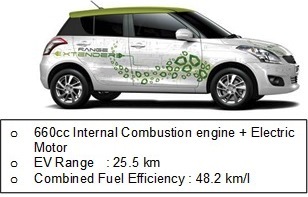 Working on future technologies, under the National Electric Mobility Mission Plan 2020 (NEMMP), Maruti Suzuki has demonstrated the Swift Range Extender (REEV). Swift RE-EV is an electric vehicle with an engine driven generator. The vehicle functions like a pure Battery Electric Vehicle (BEV) for customers who commute short distances. Once the battery power is depleted, the on board IC engine starts functioning and runs the generator for supplying power to the electric motor, thereby eliminating the “range anxiety” issue generally associated with BEV’s. The vehicle can be charged at home from a household power outlet.